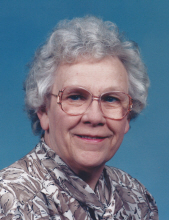 Virginia A. Nelson, 83, of Kewanee, died Thursday, November 22, 2018 at Kewanee Care. Virginia was born August 18, 1935 in Wausau, Wisconsin, the daughter of George and Bertha (Andrewson) Nelson. She was preceded in death by her parents; twin brother, John Nelson; brother in law, John Auwerda; two nephews, Richard and Robert Auwerda and one great nephew, Jake Auwerda. Virginia lived in Wheaton and graduated from Wheaton College Academy in 1954. She attended Wheaton College and North Central College, graduating with a bachelor’s in science degree. She then taught physical education in Aurora and Wheaton and directed camp in the summers. Mostly, in the Salvation Army Camps, the camps came in a variety of youth, music, golden age, blind and deaf. This led to becoming a Salvation Army officer and she was sent to Kewanee to work with the children to the elderly. The Salvation Army wanted to do something for the Senior Citizens of Kewanee, so they formed a committee to bring about a Senior Center. After quick growth, it became the Henry County Senior Citizens Inc. Virginia gave 37 years to this organization. She was active on the state level, was a member of the Association of Illinois Senior Centers, and a former president of that organization. Virginia was also a member of the Illinois Coalition on Aging and was former president there as well. She served as chair of the Illinois Delegation to the 1995 White House Conference on Aging. Virginia received the Woman of the Year award from the Kewanee Business and Professional Women’s in 1983 and later the outstanding Citizen of the Year Award from the Ambassadors Club. Virginia’s hobbies included collecting and giving programs on antique dolls, and portraying some historic people such as Florence Nightingale, Fanny Cosby, Mother Theresa, Mary, Mother of Jesus, Betsy Ross, Mary Todd Lincoln, and even Fred Francis. Virginia is survived by her sister, Marion Auwerda, Keystone, NE; three nephews, David Auwerda, Ed Nelson, Ron Nelson; fourteen great nieces and nephews and six great-great nieces and nephews. Funeral services will be 11:00 a.m. Wednesday, November 28, 2018 at Schueneman-Tumbleson Funeral Home, Kewanee Visitation will be from 10:00 a.m. till time of service on Wednesday at the funeral home. Burial will be in Pleasant View Cemetery. Memorials may be made to the Kewanee Senior Citizen’s Center. Please leave an online condolence for Virginia’s family at www.schuenemantumblesonfuneralhome.com. To send flowers or a remembrance gift to the family of Virginia A. Nelson, please visit our Tribute Store. "Email Address" would like to share the life celebration of Virginia A. Nelson. Click on the "link" to go to share a favorite memory or leave a condolence message for the family.